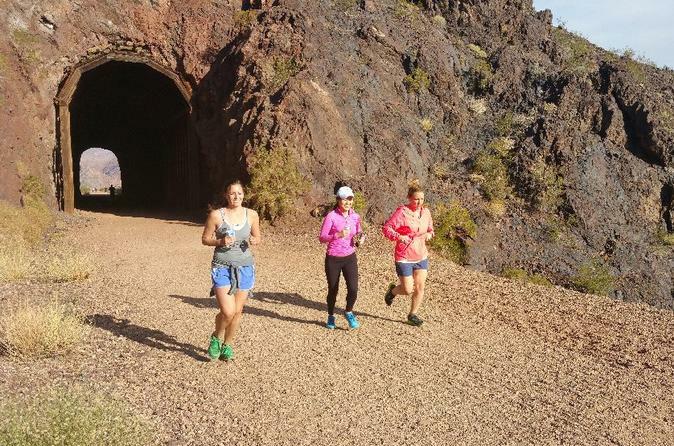 This Las Vegas Trail Run is an 8-mile (13km) run which follows an old railroad bed high above Lake Mead and runs through five 25-ft (8m) diameter tunnels (roughly 30yds or 10m in length) cut through volcanic ridges. Take in the beautiful vistas of Lake Mead or possibly see desert big horn sheep during your run. This run is perfect for individuals or groups. Transportation and refreshments are provided. Sit back and enjoy the ride from the Las Vegas Strip to the Historic Tunnels Trail Head. Upon arriving, you will immediately see the amazing beauty of the Mojave Desert. The trail run begins at the Historic Tunnels Trail head, just inside Lake Mead National Park. The trail surface is suitable for all levels of experience. The trail is an old railroad bed, so it is graded and perfect for beginning trail runners. The railroad was built in 1931 and used for hauling equipment and materials during the construction of Hoover Dam. The railroad was used heavily until the dam was finished in 1935, but dam workers continued to use it until 1961. The tracks were dismantled in 1962, and the site was nominated to the National Register of Historic Places in 1984. Once underway, you can't help but notice the amazing views of Lake Mead and the surrounding mountains. Beautiful vistas are bountiful and unobstructed! Find yourself in awe as you run through the five massive tunnels that were used to haul materials and workers to the Dam everyday from 1931-1935. There are many great picture opportunities that you'll want to take advantage of. As you leave the 5th tunnel behind, the trail starts to wind its way down to the Dam sight. Pass by the old scrap yard which still houses relics of Hoover Dam past. Continue to wind down the trail and pass through a power sub station sending out power generated by the Dam. You've reached the Dam! Well, almost. Traverse a few switch back ramps, a few stairs and arrive onto the amazing Hoover Dam. There are plenty of picture taking opportunities. Run across the Dam and into the great state of Arizona and also into another time zone. Upon leaving Hoover Dam, challenge yourself as the stairs, ramps and slight uphill climb will challenge all runners. This is short lived and the trail returns to an easy grade upon reaching the tunnels.